By the time we have filled our basket, my little one’s hands and face are red from picking (and eating) fresh berries. As we walk out of the berry field, he keeps stopping to pick just one more. When we finally reach our car, his chubby cheeks and grubby hand are full of berries. Sometimes when we arrive home, I realize that most of our berries have already been squashed or bruised by eager little fingers. Once I had a whole bunch of berries that needed to be eaten quickly. A strawberry rhubarb crumble sounded like a good place to hide squished berries. The only problem was that I could not find a recipe that was both grain-free and nut-free. 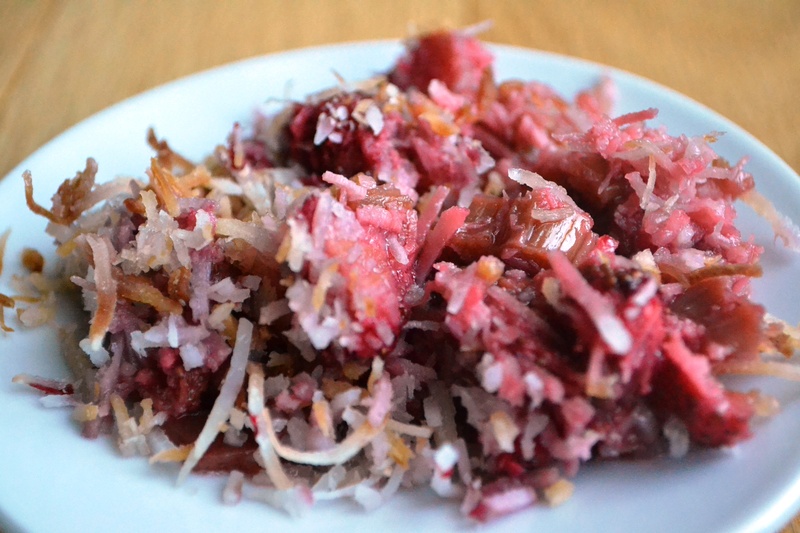 I decided to try shredded coconut for a topping and was amazed at the result. It is delicious! Layer fruit in a 9×9 inch baking pan. Drizzle with honey and top with coconut. Bake at 325 degrees for about 25 to 30 minutes until the fruit is soft and the topping is slightly brown. Enjoy hot or cold!